Now available as an ebook! You may order a copy from the distributor, amazon.com, or itunes; order an ebook (amazon.com or Barnes and Noble); or download a free excerpt. The part played by critical chain scheduling in a world-class solution. CEO and founder of ProChain Solutions, is one of the world’s leading experts on project scheduling and management using the “critical chain” approach. Rob is a frequent writer and speaker on the subject of project management and over the past twenty-five years has developed process improvements in the fields of health care, manufacturing, and project management. He is the author of The Billion Dollar Solution from ProChain Press and Project Management in the Fast Lane from St. Lucie Press, and a co-author of the 2010 Theory of Constraints Handbook. Rob holds degrees from Stanford University, SUNY Stony Brook, and Yale University. 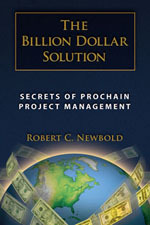 The Billion Dollar Solution is a readable, accessible book, as well as a very good addition to the project management canon. The Billion Dollar Solution is a fine and highly recommended piece for business leaders everywhere. The best book on project management in years! Rob Newbold's conversational style makes the depth and breadth of project management easy reading. Such a clear and simple explanation of the new common-sense Critical Chain solution only comes from deep, significant understanding. Learn of "Schedule Chicken," work in the "Confetti Factory," and discover "Duck Farming." See how to dramatically deliver projects much faster, on-time and under budget. Find the Leverage Points and the Work Rules to make Critical Chain work. Learn how to gain cooperation, change culture, and successfully implement and institutionalize fast, reliable, and complete projects. Learn the Pitfalls and Tips for developing project plans, pilots and multi-project success. I highly recommend The Billion Dollar Solution to the novice and experienced project manager, including Critical Chain experts. Rob Newbold's latest work, The Billion Dollar Solution, is a real treat. The book makes crystal clear why and how business leaders can greatly improve their project management performance through the deft application of critical chain scheduling. The results are impressive: that's what I've seen amply demonstrated in numerous winning companies that adopted the practices championed in the book. Newbold's conceptual and practical mastery of the subject is particularly evident in his clear-headed discussion of implementation issues (read: change management). As he correctly points out, the true payoff of these practices comes when they enhance the way people work together in a synchronized fashion. Highly recommended.